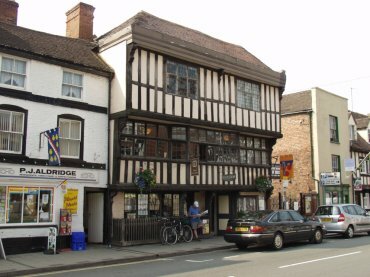 This building is a 17th century rebuild of an earlier structure which was the old Hat Shop. The date on the door lintel shows 1664 confirmed using dendrochronology. Notice the double jettied construction. The top storey overhangs the first storey which overhangs the bottom one. This is but one of Tewkesbury's alleys which lead from the main streets of the town. 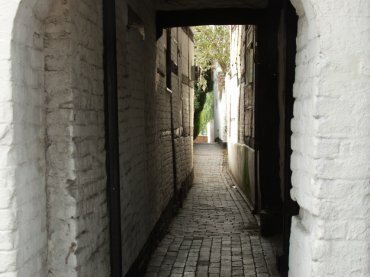 Although Tewkesbury is described as one of England's best preserved medieval towns these alleyways were created much later, towards the end of the 17th century, and only 30 of the original 90 alleys survive. 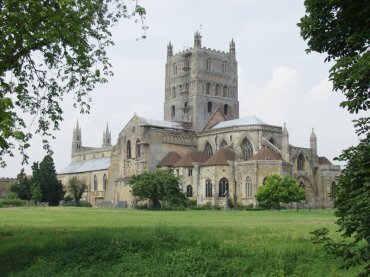 You can buy a leaflet from the Tourist Information Centre which will guide you on a walk around Tewkesbury's alleyways. This Norman Benedictine abbey church dates from the 12th century and its tower is the largest surviving Norman tower in the country. This view is from the south-east. By the Old Mill, Tewkesbury. 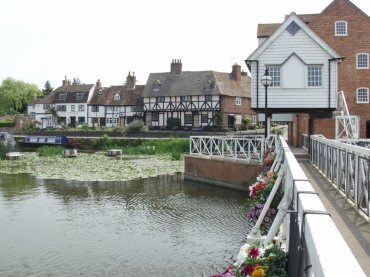 The foundations of the mill on the right are though to date from the 12th century when the River Avon was diverted into the town, now known as the Mill Avon, to power the mill of the Benedictine Monastery. The current building dates from the 18th century and was in use until 1933.